dreamworld hermetica firefly swatches | More Tea, Wesley? FIREFLY!! A warning up front that this post is going to be long and full of gifs and quotes, because I can’t not get heavily excited about this show. As I’ve mentioned before, I’m a huge Joss Whedon fangirl. So whenever brands do collection based on his stuff, I’m basically powerless to resist. I must try them; it is my duty. I’m drawn to them like a cat to a Katsak… that is to say, magically. There are more Firefly collections than any of his other works – I can think of four or five Firefly/Serenity collections, but just one Buffy collection, one Avengers collection (I’m sure there are more!) and zero things based on Angel, Dollhouse (which, meh, it had its bright spots but to be honest I wasn’t a huge fan of that one), or Dr. Horrible (THIS IS A CRIME, GIVE ME AN EVIL LEAGUE OF EVIL EYESHADOW COLLECTION. BAD HORSE. FAKE THOMAS JEFFERSON. DEAD BOWIE. GET ON IT, INDIES!). Ahem. Anyway, what I’m getting at here is that I’d been meaning to try out Dreamworld Hermetica for a while, but then they released a Firefly collection and my need became greater, and then they had a really crazy sale and, I don’t know, I guess I blacked out or something because a whole bunch of eyeshadows ended up at my house. Some nefarious actor who isn’t me ordered stuff from other collections too, but those will be featured in another post. Firefly gets its own post, always. First up, a quartet of warm pinky-purpley colors. All shadows were swatched over primer + Pixie Epoxy. Ambassador: A beautiful rose mauve. A very red-toned medium purple with a satin finish, inspired by Inara. Inara always gets this sort of color in Firefly collections (if I was smart I would’ve swatched it with Geek Chic’s Ambassador for comparison, buuuut I’m not – I think it’s darker and more purple), which is fine because it does suit the character and her opulent wardrobe. It’s lush and pretty, if perhaps a bit too pink for my personal taste. Book: Well, I wasn’t expecting to see a state official either. Ambassador. [shakes her hand as Mal laughs.] I’m missing something funny. 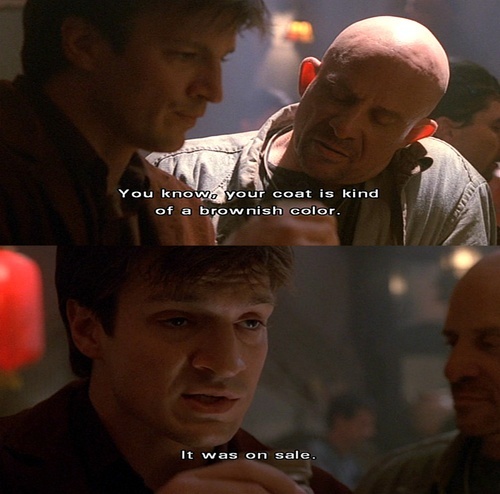 Mal: I always get those mixed up. How’s business? Fog: A muddy burgundy/purplish color. A stunning soft metallic mauvey, pinkish-purplish-tannish-taupeish kind of color. I can’t with this, it’s gorgeous. It reminds me of a less silvery/warmer/slightly more brown version of Shiro’s He Loves His Hammer. Mal: I got no answers for you, Inara. I got no rudder. Wind blows northerly, I go north. That’s who I am. Maybe that ain’t a man to lead, but they have to follow so you wanna tear me down do it inside your own mind. Mal: But you fog things up. You always have – you spin me about. I wish like hell you was elsewhere. Kaylee smiles and the whole world smiles with her. Shiny Young Mechanic: Soft pink that has satin finish. A metallic peach, slightly pinkish. Shiny and adorable, just like Kaylee. Mal: I don’t believe there is a power in the ‘verse that can stop Kaylee from being cheerful. Sometimes you just want to duct tape her mouth and dump her in the hold for a month. Autumn Flower: Moderate neutral brown with a variety of orange undertones. A warm reddish brown with coppery shimmer. Zoe’s color palette was all warm browns, creams, and reds, so this is a very appropriate shade. Zoe: You could lock the door and keep the power-hungry maniac at bay. I love this set, I think they all go so well together. Shiny. No More Running: Soft peachy pink perfect for a highlighter! A beautiful pale peachy pink, like Shiny Young Mechanic’s lighter sister. Mal: You all got on this boat for different reasons, but you all come to the same place. So now I’m asking more of you than I have before. Maybe all. ‘Cause as sure as I know anything, I know this: They will try again. Maybe on another world, maybe on this very ground, swept clean. A year from now, ten, they’ll swing back to the belief that they can make people… better. And I do not hold to that. So no more running. I aim to misbehave. Honour: Warm neutral with blue undertones and satin finish. This is an odd one. It’s kind of a matte putty peach with a very slight silvery blue shift. It looks warmer on an angle and/or in sunlight than it does head on or in the shade. Badger: What were you in the war? That big war you failed to win – you were a Sergeant. Yeah, Sergeant Malcolm Reynolds, Balls and Bayonets Brigade, big, tough veteran, now you got yourself a ship and you’re a captain! Only I think, you’re still a Sergeant, see? Still a soldier. A man of honor in a den of thieves. Well it’s my gorramn den and I don’t like the way you look down on me. I’m above you. Better than. Businessman, yeah? Roots in the community. You’re just a scavenger. Gift: A pretty metallic peach color. A pretty light pinkish copper. Simon: I’m very smart. Went to the best Medacad in Osiris, top three percent of my class, finished my internship in eight months. “Gifted” is the term. So when I tell you that my little sister makes me look like an idiot child, I want you to understand my full meaning. River was more than gifted. She was… a gift. Everything she did, music, maths, theoretical physics – even dance – there was nothing that didn’t come as naturally to her as breathing does to us. She could be a real brat about it, too. Miranda: Golden overtones with burgundy undertones that has created an awesome bronze color. A metallic orange copper with some dark red in the base. Ellie threw this in as an extra, which is fortuitous since I almost bought it. Kaylee: How can it be there’s a whole planet called Miranda and none of us knowed that? Mal: Because there isn’t one. It’s a blackrock. Uninhabitable. Terraforming didn’t hold, or some such. Few settlers died. River: [to Simon] I had to show them. I didn’t know if you were going to make me sleep. Wash: But there’s nothing about it on the Cortex – history, astronomy… it’s not in there. Mal: Half of writing history is hiding the truth. There’s something on this rock the Alliance doesn’t want known. Browncoats: Medium to dark brown with golden undertones. Mal: Just focus! Alliance said they were gonna waltz through Serenity Valley and we’ve choked ’em with those words. We’ve done the impossible and that makes us mighty. Just a little while longer, our angels’ll be soaring overhead, raining fire on those arrogant cods, so you hold. You HOLD! Second verse, same as the first. Click to embiggen. P.s. Pun totally intended. My feelings about this collection overall? The shadows are very soft and wonderfully pigmented, and the color selection really does represent the overall color scheme and feel of the show well – it’s mostly warm, with lots of dusty neutrals as well some cool blues and silvers to represent the Alliance. Of the shades I chose, my favorites are Fog, Shiny Young Mechanic, Autumn Flower, No More Running, and Gift, with Fog and No More Running getting absolutely top billing. I’m intrigued by Honour and am interested to see how it looks on – I don’t know that I have anything like it, which is impressive considering the absurd size of my eyeshadow collection. Dreamworld Hermetica has taken their shadows off the website for a short time because they’re revamping the sizes and pricing, but they should be back soon if you too would like to smear futuristic space western pretties all over your face and then sob them off while re-watching Firefly’s tragically short run for the eleventy millionth time and thinking about what could have been. DAMMIT FOX. Hold me. Loved the review and I LOVED the fact that you had the dinosaurs pictured with the pigments! I am a huge Firefly fan and I am going to have to pick up this collection now. Haha, thank you! It seemed appropriate. And writing about collections based on stuff I love is always a treat. 😀 I highly recommend checking this collection out, I’m really impressed with it!